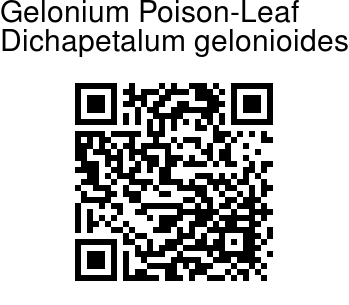 Gelonium Poison-Leaf is a large shrub or small tree, up to 5 m tall. Branchlets are slender, round, velvet-hairy. Leaves are simple, alternate, distichous. Stipules are linear-lanceshaped, up to 0.5 cm long. Leaf-stalks are 0.1-0.4 cm long, velvet-hairy. Leaves are 5-11.5 x 2-4 cm, elliptic, tip bluntly tapering with mucronate tip, base narrow, margin entire, papery, sparsely velvet-hairy on midrib and nerves beneath. Midrib is raised above, secondary nerves 5-6 gradually curved. Flowers are borne in fascicled cymes in leaf axils. They are small, creamy-white. Fruit is 1-2 lobed, velvety, 2-seeded. 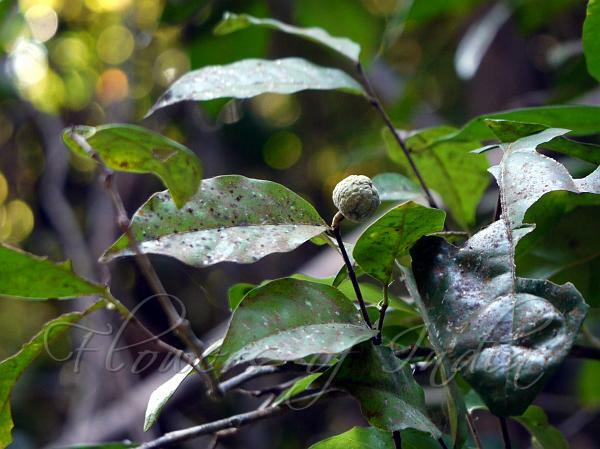 Gelonium Poison-Leaf is found in the forests of Indomalaysia, Western Ghats, South and Central Sahyadris, up to 1400 m.
Photographed at Netravali Wildlife Sanctuary, Goa.